Unknown Packages Queens is a series of eight different storytelling performances as part of the Studio Program at the Queens Museum. The team Unknown Packages consists of five artists who explore the possibility of "storytelling” within the field of visual art. These artists combine their object-based visual media with time-based forms, wherein their artworks are staged on a platform, to convey their stories. Since June 2015, the team has been engaged in a "Performance Workshop” working within the given circumstances of the Queens Museum. This month, they will continue their activation of the museum–turning studio No. 8 and the Triangle Gallery into an arena to stage their storytelling performances for the public. Jul 30, 3pm and Aug 1, 3pm – Love and Withstand, 9min. Aug 5, 3pm and Aug 7, 3pm – Back Before the Blink, 6min. 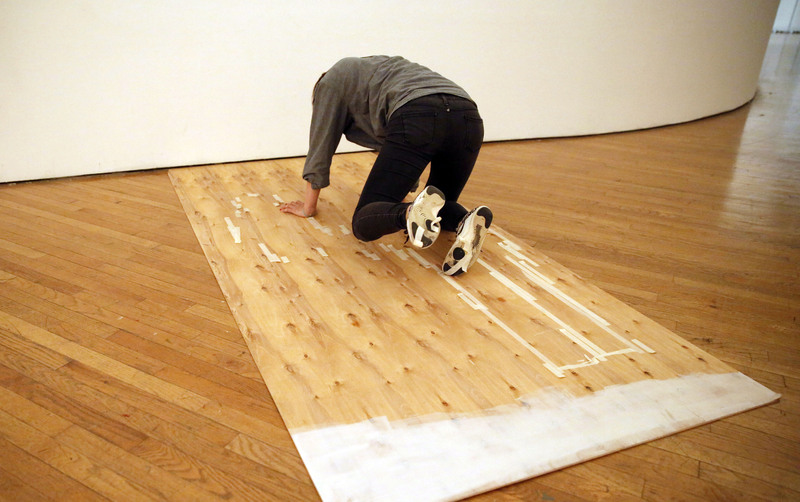 Boram Moon presents a two-part, movement-based performance focused on the spatial relationship between the performer (5’4’’) and an 8 foot tall panel. The performer’s varied movements connect her body with the "Panel” in different ways, in order to show the physical, emotional, and the psychological states characteristic of intimate relationships. Throughout Love and Withstand, she often bears the entire weight of the panel on her knuckles to raise it up, and an incessant struggle between the panel and the performer ensues. Afterward, they reappear in Back Before the Blink, like shadows that spill over a bedroom at bedtime and vanish in an instant. They repeatedly enter and exit and, in transformation, duplicate or magnify themselves. Boram Moon (b. South Korea, 1988) has been working on performance in collaboration with other artists, sharing the common experience of the physical. Fundamentally, whatever the given situation, she deals with human figures and movement as spatial elements. Her works have been presented in institutions such as Takeout Drawing, Itaewon, and the Seongbuk Museum of Art in Seoul. Jul 29, 3pm – Spot, 9min. Aug 5, 3pm and Aug 7, 3pm – Desert, 6min. Spot and Desert are storytelling performances involving one narrator and 3–5 sub-performers. The narrator—"I”—plays multiple roles while controlling the rhythm of the narration. "I” moves around, piercing the architectural features of the space when choosing a place to build an energetic atmosphere for the performance. Meanwhile, the sub-performers play particular characters in the performance using props and their own bodies. The characters include boys, an old man, neighbors, a police officer, "the Chinese,” and "the Bedouin,” who all come across the stage. They project their primitive proprietary desires on the place, a riverside and a desert, revealing their vicious tempers, and showing their aggression and will to claim the territory they covet. "I,” the only person who comes to the place with a clear vision, captures the overview of the scene while simultaneously getting caught up in a power struggle, further aggravating the dispute. Ikjung Cho (b. South Korea, 1986) deals with narratives that are revealed through observation based on daily hassles and occasional discord. She uses a personal approach to discuss how every individual is engaged with wider sociocultural concerns, by using various forms of expression including drawing, performance and video. She studied fine art at Ewha Womans University, Seoul and the Chelsea College of Art and Design, London. Her works have been shown in several institutions e.g. Doosan Art Center, Seoul; L’espace des arts sans frontiers, Paris; L’appartment 22, Rabat, Morocco; Arts Admin, London; The market studios, Dublin. Jul 30, 3pm – Raoulia of Liverpool, musical collaboration with Dirk Flach, 7 min. Aug 2, Aug 5, 3pm and Aug 7, 3pm – Begging Rhetoric, 10 min. Jinju Lee uses her paintings to tell stories. In Raoulia of Liverpool, she invites viewers into a narrow, dark corridor of the museum, where collected portraits of exotic-looking plants are introduced one by one, along with interwoven stories about them and the city that they inhabited. In her recent work Begging Rhetoric, she continues her exploration of urban sites, addressing the issue of panhandlers in New York City within the Museum space. Incorporating images, motions, and acoustics, she communicates her collection of tales about beggars to the audience. As individuals who live in the city, audience members are familiar with the conflict between one’s own desires and needs and the needs of others that emerge in highly populated public space. In this way, Begging Rhetoric questions how much one can ask of another, and how much one can take. Jinju Lee (b. South Korea, 1987) is a painter who has a deep interest in dealing with the space outside of the canvas. She has been especially working on combining narratives and pictures and how to present them in a new form of image production. As of 2012 she has been researching for her MFA degree in the class of Prof. Alexander Roob, at State Academy of Art and Design Stuttgart, Germany, and she has shown her works in several institutions including Kunstverein Feuerbach, Stuttgart; Galerie Modul Acht, Dresden; and Eventheneck, Seoul. Jul 31, 6:30pm and Aug 8, 3pm – Dawn Breaks–Reading, 30min. / Dawn Breaks–Rising, 30min. In Dawn Breaks, Jihyun Jung and Jewyo Rhii hold a dialogue with their Talking Machines—devices that were invented to generate and present stories as they are operated. The machines perform with specialized effects: creating images, sounds, blinking, and darkening, choreographed to communicate each story they deliver. Dawn Breaks suggests the possibilities of storytelling through the temporary gathering and combination of images, objects, and languages, which differ from familiar forms of narrative, such as the linear structure of literature and film. Utilizing diverse media that includes installation, video, and painting, Jihyun Jung (b. South Korea, 1986) records the meaningless (meaningful) actions that an individual performs in everyday life, revealing a sense of helplessness regarding the situations that one encounters in reality. The combination of fragmented images and the fumbling movements of objects that appear in his works produces a sense of illusion, as if one were viewing a play. His most recent exhibitions have been at Doosan Gallery New York and Seoul Museum of Art, Seoul. Since the early 1990s, Jewyo Rhii has worked in sculptural installation, video, drawing, performance and publications. Constantly displacing herself from her native Seoul, Korea, to study and work in Western Europe and the US, Rhii has come to embrace this fluid lifestyle as an integral part of her process, in such a way that her studios have functioned as exhibition spaces, and exhibition spaces as studios. She has occupied a studio space at the Queens Museum since November 2013.